Taipei, April 14 (CNA) President Tsai Ing-wen (蔡英文) ordered national security officials to keep a close watch on actions by China's People's Liberation Army (PLA) and the ongoing civil war in Syria to protect Taiwan's political, economic and security interests. In a statement issued Saturday night, the Presidential Office said Tsai met with high-ranking officials from national security and defense agencies and issued four orders. The first was to have a comprehensive grasp of the PLA's actions in the air, on land and at sea to be ready for any military confrontation. The president said Taiwan must maintain its "no provoking yet no surrendering" policy when it comes to national defense to protect its people. Her second order called for relevant agencies to survey media reports related to national security and clear up any stories that may be misleading or present false information. 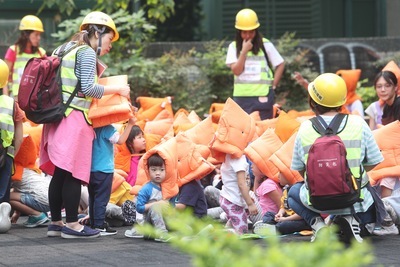 Following the airstrikes against Syria launched by the United States, the United Kingdom and France on Saturday morning, Tsai also wanted the team to monitor the situation in the Middle Eastern country, especially the condition of its civilians. She condemned the Syrian government's alleged use of chemical weapons on civilians there and supported global sanctions against the country. Lastly, Tsai called for the Cabinet to work with relevant agencies to prepare potential countermeasures to stabilize prices of commodities and the stock market in Taiwan should developments in Asia or the Middle East affect Taiwan's society and economy. Among the officials attending the meeting were Vice Premier Shih Jun-ji (施俊吉), National Security Council Secretary-General David Lee (李大維), Defense Minister Yen Teh-fa (嚴德發), Foreign Minister Joseph Wu (吳釗燮), and National Security Bureau Chief Peng Sheng-chu (彭勝竹).